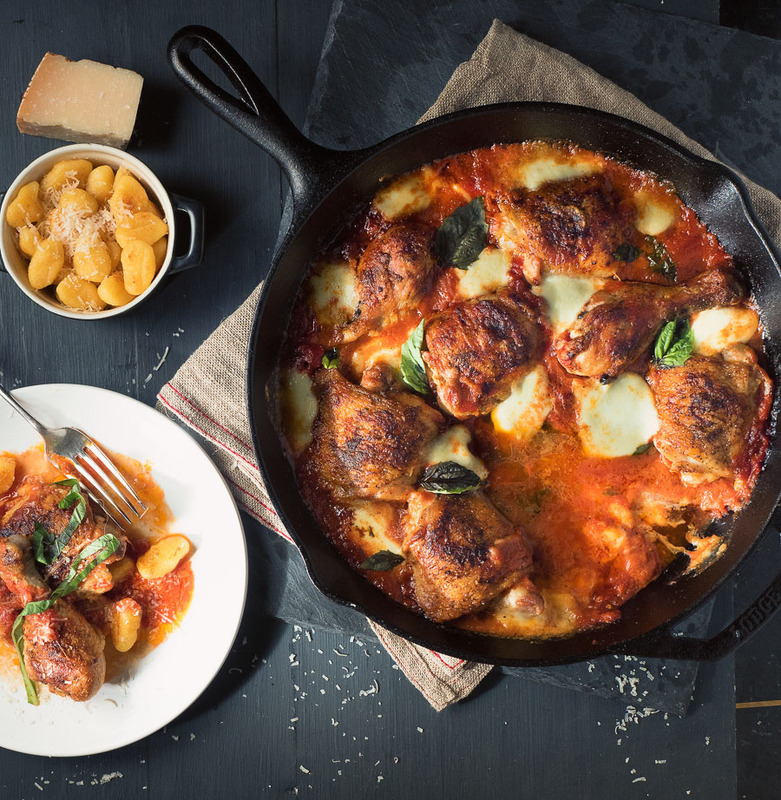 Skillet chicken with mozzarella and tomato. Pizza chicken. It’s a recipe mash up. Roast chicken meets pizza Margherita. It’s not on a menu anywhere but it should be. It’s that good. Chicken. Tomato. Cheese. What’s not to love? This is a one skillet meal. Sort of. If you really want to keep it to one skillet you can make the marinara sauce in the skillet. Drain it off and fry the chicken. Or you can break down and use a pot along side. An extra 30 seconds of clean up. You are going to need a big skillet. Like 12 inches. If you don’t have one of those maybe this should be a 2 skillet chicken dish. Or use a smaller skillet to cook the chicken in batches then finish it in a baking dish. Up to you. Pizza chicken works pretty much no matter what it’s cooked in. It’s not that picky. It’s secure in it’s deliciousness. Not worried about it. Angst-free. 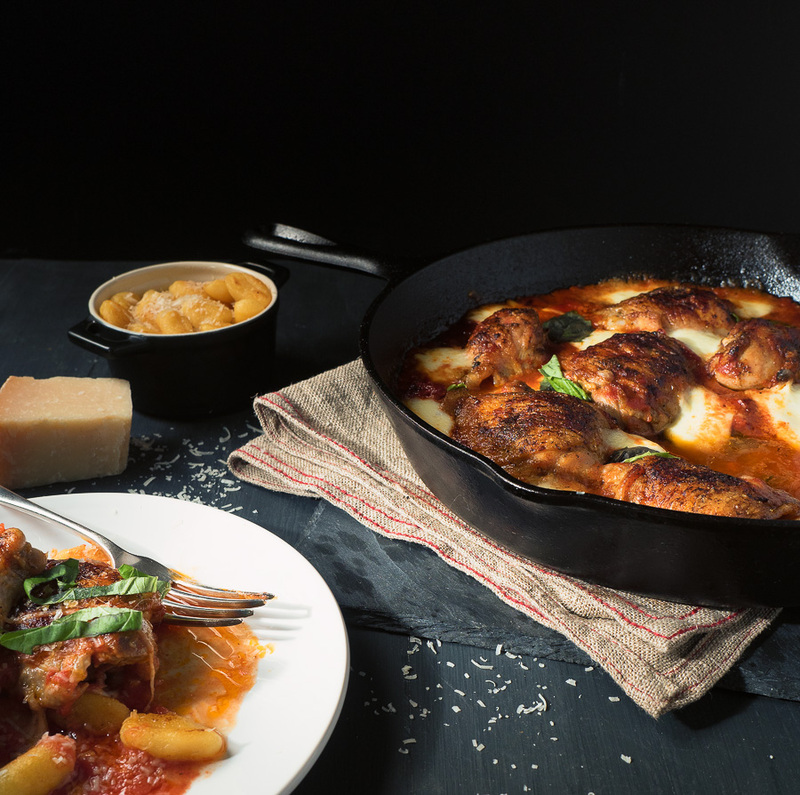 The magic in this pizza chicken recipe is the layering of the flavours. Browning the chicken gets you a fond in the pan. Deglazing with marinara sauce gets that fond into the sauce. That’s depth. Roast chicken drippings in the sauce. Another layer. Fresh mozzarella melted into the dish. The jewel in the crown. A quick flash under the broiler. The final layer. Layer upon layer of just damn tasty. Once you understand what the layers can bring to dinner you will want to make pizza chicken again and again. Calabrian chilies add a bit of heat. If you can’t get Calabrian chilies don’t worry. Use crushed chilies or maybe a bit of harissa. It’s still going to be great pizza chicken. Anchovy disappears into the sauce. Undetectable as an ingredient but an umami bomb. Don’t be scared of the anchovy. You will not taste it. Like a restaurant Caesar salad dressing. Have you ever sent one back because it tastes like fish? You can be sure all the better restaurants put it in their dressing. But if it really freaks you out leaving it out won’t kill the pizza chicken. This is my version of Melissa Clark’s pizza chicken. If you don’t know Melissa Clark look her up. New York Times. I’m a fan. All sorts of really good recipes. 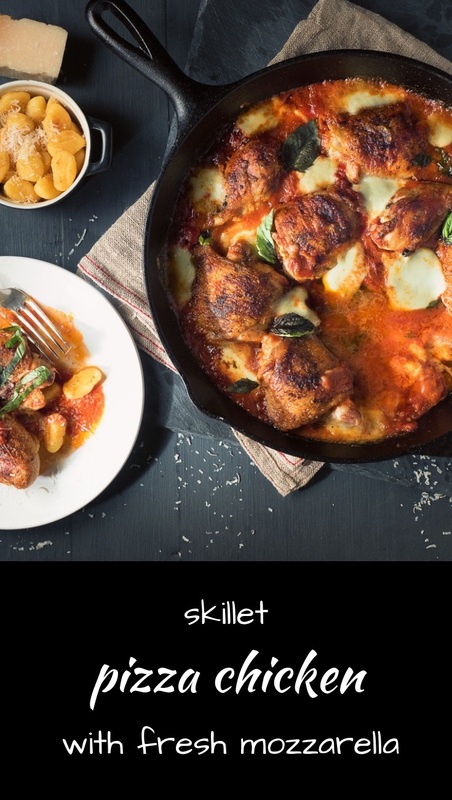 Skillet chicken with mozzarella and tomato is a chicken Margherita pizza without the crust. Melted mozzarella, crispy chicken and marinara sauce. What's better than that? Hand crush the tomatoes, removing the tough piece of core in each tomato (the stem end). You could just put them through a food mill but using your hands is fun. Heat the olive oil over medium low heat in a 3 quart pot or sauce pan. Add the fat back or pancetta and cook until the fat is rendered. If you use fat back, remove the rinds. Spoon off all but 2 tablespoons of fat. You can use the extra to fry the chicken. Add the onions, regulating the heat so they turn translucent but do not brown. Cook for about 3 minutes. Add the minced garlic and cook another 30 seconds. Pour in the crushed tomatoes, add the salt and simmer for about half an hour. You can cut back on the simmering time if you are in a rush. The sauce continues to cook with the chicken. Heat the olive oil in a large skillet (12 inches is about right). Brown the chicken well. Take your time. 10 minutes is about right. Remove the chicken and spoon off all but about 1 Tbsp of the fat in the pan. Add the Calabrian chili and anchovy and cook briefly. Add about a 1/2 cup of the marinara sauce and scrape up all the brown bits (it's called a fond) in the bottom of the pan. Mix in the remaining marinara, add the basil and bring to a simmer. Top with the chicken. Try to keep the browned skin above the surface of the marinara to keep it crisp in the oven. Cook until the chicken reaches an internal temperature of about 165F, around 20 minutes. Remove from the oven. If the sauce is overly runny, remove the chicken and simmer the sauce briefly to thicken. Set your oven up to broil. 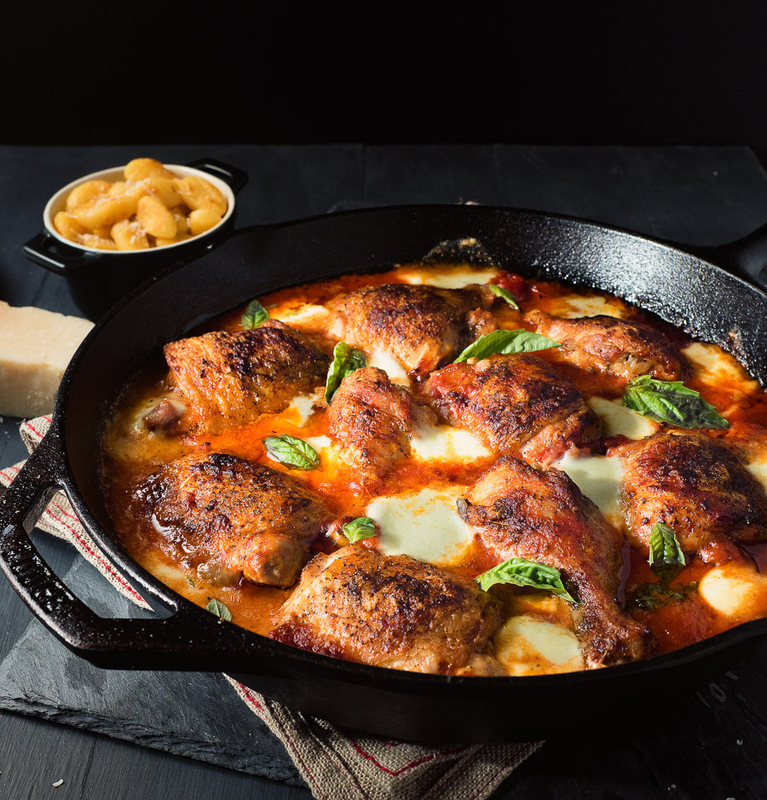 Return the chicken to the pan and sprinkle chunks of mozzarella overtop and place under the broiler to melt the cheese. Garnish with a bit of shredded basil. Serve with a bit of gnocchi if you want a starch. Rapini makes a nice vegetable complement if you want a vegetable on the plate. Or just serve it with good crusty bread to sop up the sauce. Cutting a chicken up into 10 pieces - 2 drumsticks, 2 thighs, 2 whole wings and each half of the breast cut into half again. In american, italian, main course, poultry. Bookmark the permalink. Wow your photography looks amazing!! I am literally drooling right now! That crispy looking skin and melted cheese! WOW! 😀 I’m a huge fan of using anchovy and it is kind of funny how whenever I mention it’s in a recipe or if I’m going to use it people cringe but you can’t even taste it right? Thanks Joyce. Very kind. I’ve been trying to get better at photography so that’s nice to hear. I don’t understand the fear of anchovies in cooking. I get they aren’t very tasty straight out of the jar but they add a real dimension when cooked. Plus every decent restaurant caesar salad has pronounced anchovy taste. Made this last week. Romain, no surprise, it was amazing! 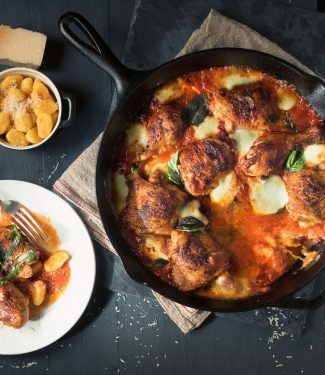 The gnocchi was a perfect match, and the chicken was fool proof. This was what, I can only presume, my Mother was trying to achieve in the 90’s when she would throw a can of Campbell’s Tomato soup over chicken thighs and served it with spaghetti, and over boiled broccoli. You also got a big thumbs up from a picky 4 year old!! So that’s an achievement unto itself. Will 100% be making this again and again! Makes killer leftovers, perfect for making your co-works jealous!